Our pocket ashtray is a free packet case made in carton. The pocket ashtray just makes up one with the packet of the smoker who has always it with him. make advertising, the financing and the distribution are FREE. Inserting the packet into the case, oxygen is driven out so the cigarette end goes out in few seconds. pocket ashtray as often as they need. With a ratio, “folded / unfolded” from 1 to 20, it is easy to stock and distribute. cigarette ends in the nature. 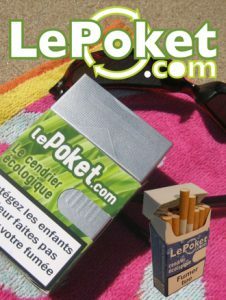 Collect the cigarette ends at the source, decreases the number of cigarette ends throw out in nature. time of collecting of the cigarette ends. “price / seen” is better than others publicities.